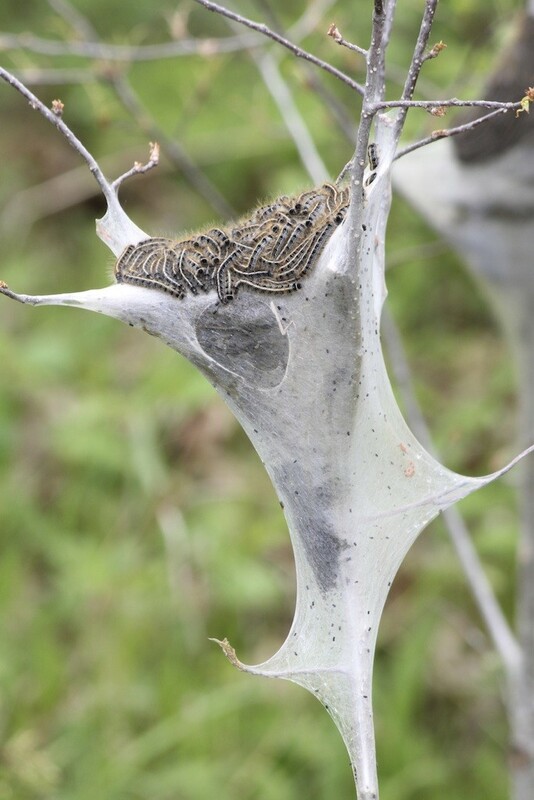 HOW BIG WILL A TENT CATERPILLAR NEST BECOME? Tent caterpillars are a very active pest from year to year. They have ferocious appetites and will eat most any plant they find. Their nests are unsightly, their eating will injure plants and they readily migrate into most any structure making a mess along the way. 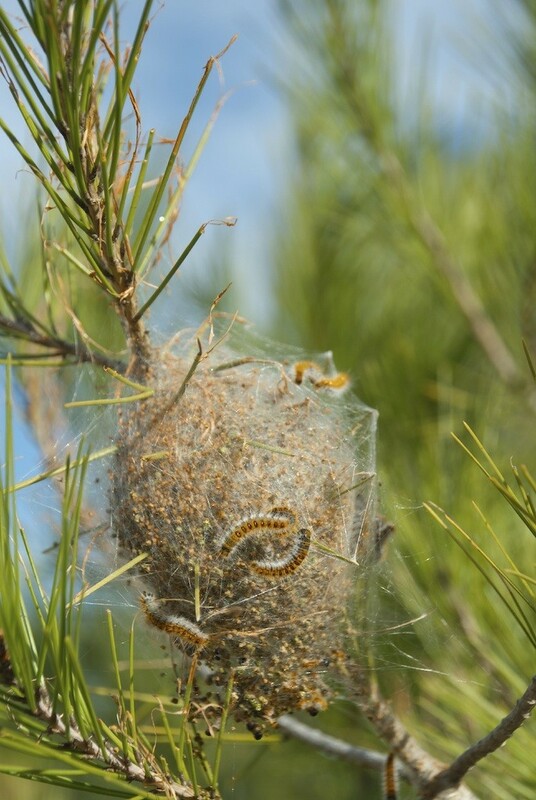 This article will detail all you need to know about tent caterpillars and then explain how and what to use for controlling local infestations and nests on your property. Tent caterpillars are 2 to 2.5 inches long. They are generally dark – mostly black – with a few long, bright colored stripes which run down their back. Blue dots are commonly prevalent, along with other colors on their body. These lines may be brown or yellow. Tent caterpillars will hatch from eggs in early spring. Though barely noticeable during this young stage, they will become active as local plant life starts to grow its spring foliage. It is this foliage the caterpillar larva need. They will eat what they find and if the host tree or shrub on which they originate does not provide adequate food, they will migrate to other nearby local plants. For the next two months, the larva will feed during the day growing bigger and bigger. At night they will return to their host tree and start to spin a constantly growing “tent” in order to accommodate their ever increasing size. This tent will become more and more apparent as spring turns to summer. Generally unsightly, these tents are white and silky looking usually appearing where limbs of the host tree grow in two separate directions. This forked location provides a good strong foundation on which their nest can support the ever increasing weight of the local colony. These colonies will start out with several hundred caterpillars and “tents” can be as small as a soccer ball or as large as a small car! By the end of June or early July, feeding larva will have reached maturity and will instinctively want to leave their nests. Tents will be vacated and caterpillars will be seen migrating in all directions with no specific destination. They will be seeking a place to hide and pupate but they aren’t quite sure where this place will be. During their migration, they will commonly crawl on homes. They will be seen on the sides of houses and some will end up inside if proper treatments are not done to keep them out. Once a comfortable location is found where they feel safe and protected, they will spin a cocoon and undergo metamorphosis. In another 2-4 weeks they will emerge as adults, find a mate and reproduce. Females (adult moths) will find a suitable host plant on which to lay eggs and once found, will leave 200-300 eggs on a branch held together with a sticky substance which is part of the egg laying process. Adults will then die in late summer and eggs will rest till next spring when larva will hatch and start the cycle all over again. Tent caterpillars can do a lot of damage when they feed. Though their feeding only defoliates host plants and rarely causes immediate problems, plants which loose a lot of leaves will suffer later in the growing season. Besides looking odd with no leaves, they won’t be able to perform normal photosynthesis, they will have to spend a lot of time and energy growing new leaves to replace those which were lost and because of this, will be a lot more vulnerable to other problems like disease and parasites. In general, its not good to let tent caterpillars have their way when they identify a plant on which to feed. Furthermore, caterpillar droppings will be found underneath host plants and will make a mess on cars, homes, lawn furniture, etc. They eat a lot and consequently, they defecate a lot. These droppings will be found under any host plant and can become quite an issue if a large local population is feeding. Rarely will the droppings cause damage but do not let them lay on cars. Their droppings are acidic and will “eat” through most any car finish causing rot. Be sure to clean up their mess to avoid such staining or burning. As each caterpillar grows in size, their colony will make their “tent” larger. Though caterpillars start each season small and barely noticeable, they will grow to be over 2 inches in length and the nest “tent” will have to made bigger to accommodate each individual’s larger size. Since several hundred caterpillars may commonly live in any one tent, these nests will become significant in size over the course of a summer. Don’t be surprised to find nests the size of a basketball or larger. In general, such additions should not be welcomed in any tree or bush and if left untreated, expect more to be around the following year. Trees in which nesting is successful will tend to attract more from year to year as previous generations will instinctively know a good host plant. By allowing any nest to reside undisturbed on your plants you are basically inviting more to come around year after year. And if the damage, droppings, or unsightliness of their nests isn’t enough to make these insects a bona fide nuisance, their annual migration surely will. This migration will come during the end of their larval stage. Once larvae have had enough to eat, they will start to leave the main nest in search of a good location where they can undergo metamorphosis. This last stage is a kind of semi sleeping stage where they won’t be moving or feeding. They like to choose secure and discreet locations for this change and seem to like man made structures just as much as any tree. For this reason its not uncommon for any one house to have hundreds of these pupating tent caterpillars if left untreated. The migrating larva will be out in great numbers during this time traveling in all directions from the main nest and if they encounter a home or other structure, chances are they will try to make it their home for the next month. Since there are so many small cracks and crevices for them to enter a house, expect to find some inside living areas. 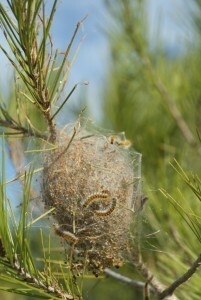 In fact many homes will actually get invaded each year if they are located in the migration path of tent caterpillars. During this time their house can be covered with larva which are simply looking for a good place to complete their life’s cycle. Fortunately, there are some very effective treatment options for controlling tent caterpillars. The “natural” spray to use is known as THURICIDE. This concentrate is basically a concentrated bacteria. Though harmless to man or other animals, caterpillars which eat plants that have been sprayed with Thuricide will die after a few days. 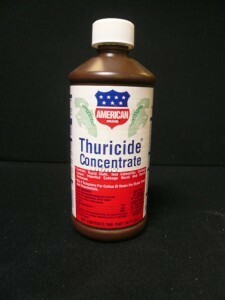 Thuricide can be sprayed on any plant, vegetable or fruit without posing a hazard and is a good preventive material to use – especially if you are treating before they arrive. Mix 1 tablespoon (1/2 oz) per gallon of water and spray the mixture over no more than 1000 sq/ft of plant foliage. Retreat every 2 weeks. 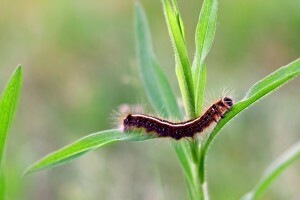 Foraging caterpillars will die within 7-10 days of feeding on treating leaves. Another approach is to apply a band of INSECT GLUE around the trunk of any targeted tree. This non-drying material is applied with a spatula, spoon or butter type knife around the tree forming a protective band over which tent caterpillars cannot travel. Make the band at least 1 inch wide; a tub of Insect glue is enough to treat 3-5 large trees. If tent caterpillars they try to walk over it, they’ll get stuck. This is an excellent protective treatment that will stop all insects from accessing beneficial plants. Anyone growing an organic garden might want something that’s labeled and certified for use on your organic fruit and vegetable crops. There are a few organic products approved and certified for caterpillars but we have found BT GARDEN DUST and MULTI PURPOSE INSECT KILLER to perform the best. Like Thuricide, BT Dust uses bacillus thuringiensis as the active. 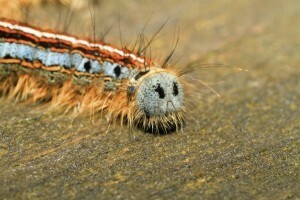 Feeding caterpillars will die within 7-10 days of eating plants and foliage with BT dust. Use 2-3 oz for every 50 feet of plants 2-3 feet high and retreat every 7 days when caterpillars are active; every 2 weeks to make sure they don’t come back. If you have tall trees, dusting will be ruled out as an option. For anything too tall to dust, use MULTIPURPOSE INSECT KILLER. This fast acting concentrate is approved for use on organic gardens (fruits and vegetables) and will last up to 7 days so expect to treat weekly when caterpillars are active. Mix 5 oz per gallon of water and apply the mixture over no more than 800 sq/ft of foliage. The strongest spray available for killing tent caterpillars immediately is BIFEN XTS. This concentrate should not be used on food crops but its excellent for any tree, shrub or even on the home. It has a very low odor and will both kill quickly and last a long time. Bifen treatments will last up to a full month and will take care of just about any pest that comes around on treated surfaces. Mix 1 oz per 5 gallons of water and use this to treat up to 5,000 sq/ft of turf and plant foliage surface area. 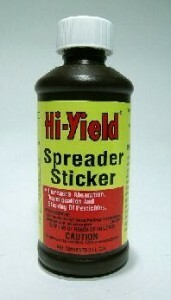 Since caterpillars are “hairy”, add SPREADER STICKER to your tank mix. This additive will allow the concentrate to better coat the target plant and the caterpillars when spraying them directly. When spraying plants, its usually hard to get good coverage because leaves have undersides that will mostly avoid direct spray. Spreader Sticker will help get coverage in these areas by dispersing the spray once it lands on targeted treatment sites. And it will enhance the immediate impact the Bifen has on targeted caterpillars. Add 1 oz per 5 gallons of mixed solution with the Bifen. If you have a bunch of nests you want to treat directly, there are two options. The Bifen XTS with Spreader Sticker will usually work if you can hit the nest with enough power to penetrate. This can be tricky since most nests will be high up in the tree and the webbing can be quite thick. To treat active tents, wait till evening. This will insure all caterpillars have returned and will be laying inside. Next, prepare the spray and be sure the sprayer you have will reach high enough to soak the nest. Using a stick or pole, poke 3-4 holes in their tent. Holes should be large enough to allow the treatment to penetrate but not too large that all caterpillars fall out. Once access holes are made, spray the solution you have prepared on the nest. Soak it to the point of runoff thus insuring the ones present will be killed and that there will be a lasting residual to get any that may be away. Another product to use for a direct treatment is HORNET KILLER. 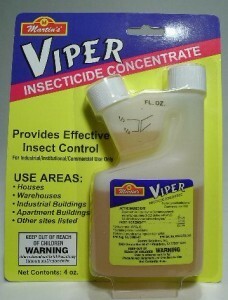 This product is generally used for bees and wasps but the unique formulation has been found to work well on caterpillars too. You still need to poke 3-4 holes per tent prior to spraying them but once access points are made, soak the nest down for a quick kill. You should be able to treat 1-3 average sized nests per can. 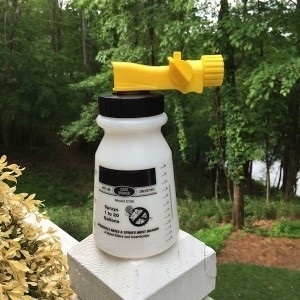 Remember, this is only good for treating nests directly and is not suggested for spraying over foliage as this will damage the tree, shrub, etc. If your home is being penetrated by the migrating adult tent caterpillars, there are two products which will both keep them from entering and kill them if they try. First, spray the entire outside of the home with CYPERMETHRIN. This concentrate mixes with water and can be applied to the foundation and up the side of the home a few feet to provide a barrier over which caterpillars will not be able to crawl. If the house already has caterpillars up in the eaves and under soffits, spray these areas as well. Cypermethrin is super irritating to caterpillars and will kill off those present as well as leave a good residual to keep them away. Mix 1 oz per gallon of water and add 1 oz of the Spreader Sticker listed above to your tank mix. 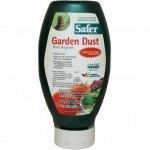 Apply 1 gallon per 500 sq/ft of surface area and retreat once every 2 weeks when caterpillars are active. If they’re already in the home, Cypermethrin can be applied to affected areas. But for areas where you can’t use a liquid, use FS MP AEROSOL. Its better suited to get into cracks and crevices since it comes with a handy tube injector. It too can be applied along baseboards, around window frames and up high by crown molding. Tent caterpillars will remain active for a few days inside the home so its important to get a good treatment down as soon as possible. If not done early enough, expect to see a lot of adult moths hatching out of pupa cocoons in 1-2 months following the initial invasion. When spraying for tent caterpillars, any PUMP SPRAYER will do the job. 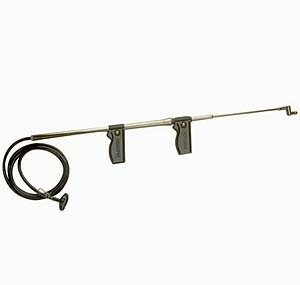 Our standard sprayer can reach up around 15 feet and is fine for low applications. If you need to reach heights of 20 feet or more, go with a TROMBONE SPRAYER. It can reach up to 30 feet no problem and is completely portable since it works by pumping out a mixed solution from a 5 gallon pail. Another option is a good HOSE END SPRAYER. These will reach as far as your garden hose can spray. Tent caterpillars are mostly considered harmless pests. However, their chewing and eating can cause damage and stress to a lot of trees and plants once they start their spring feeding. Keep them under control in the yard with any of the concentrates listed above. With any luck, this will keep them from getting inside. 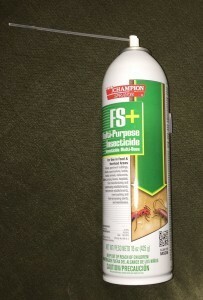 But once on the home, use Cypermethrin and FS MP Aerosol to knock out the invasion. 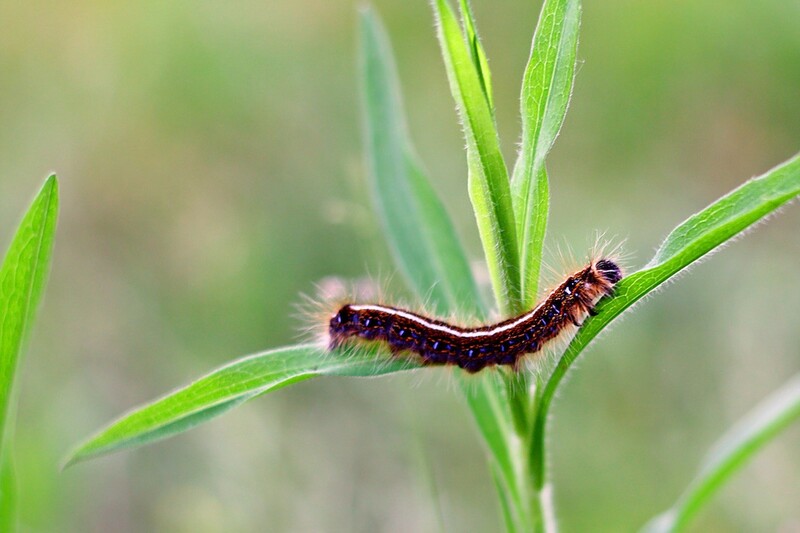 Treat early in the season to keep tent caterpillar numbers in check; kill off as many as possible once the season is in full bloom otherwise you will have that many more to deal with next year. Most all of the products listed in our article above can be used safely even if animals are feeding on plants which are treated. 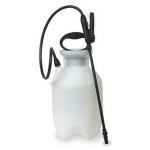 The Thuricide can be consumed with no risk to animals or people and the Multipurpose Insect Killer has just one day to harvest for people (no wait for animals but if you wanted to wait a day to be sure, thats all you’d need to do). Lastly, the Vegetables plus is a bit stronger and longer lasting with a full 7 days to harvest. So based on situation, I’d go with the Multipurpose Insect Killer since it’s strong enough to handle this pest but because its approved for organic gardening, safe enough for use on any plant animals or people will be consuming. If you review our article above, you’ll learn about this pest and what you need to do if you want to stop them from making nests. Basically larvae hatch from eggs in the spring to start new nests. Eggs can be found on tree limbs, the trunk as well as the surrounding ground under the tree. From there the larvae will climb up the tree and start feeding on new leaves as they grow out. I happen to have activity right now and will be treating with the Bifen/Spreader Sticker listed above. It generally kills all live caterpillars foraging and will keep killing them for a month. So for my yard, two treatments in the spring will usually get rid of them for the year and I expect this will help your problem too. There are many types of caterpillars maturing right now and no doubt, you have at least two species. Tent caterpillars will be pretty easy to identify because of their tents. But other moths will are surely active and due to the wide range of species in our country, their larvae will vary quite a bit. So trying to isolate exactly which species you have is a daunting if not impossible task. Regardless, they can all be controlled using the Bifen XTS listed in our article above. Use a hose end sprayer to spray all the foliage now and repeat once a week until all caterpillar activity is gone. Next summer, start spraying in May to get ahead of the problem. 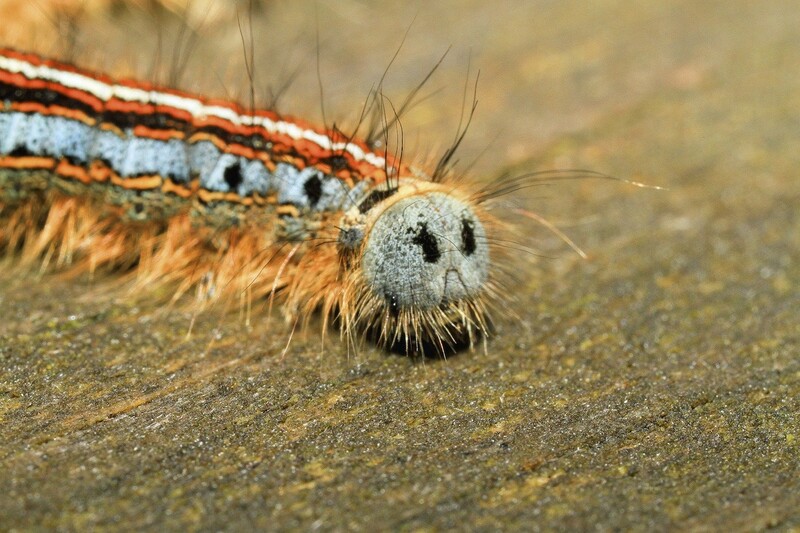 Once yards get caterpillar activity, they tend to get them year after year so even if you kill the bulk of the caterpillars right now, the remaining odors and pheromones in the yard will no doubt attract a new populous. And if left untreated, they will once again wreak havoc on your trees. The good news is Bifen will handle them easily.